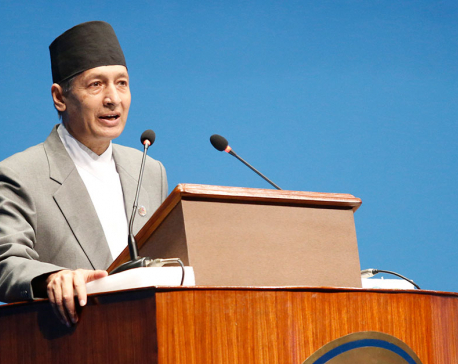 KATHMANDU, March 2: Minister for Finance Yuba Raj Khatiwada has underlined the need to reduce the farmers’ cost of production to boost agricultural production in the country. 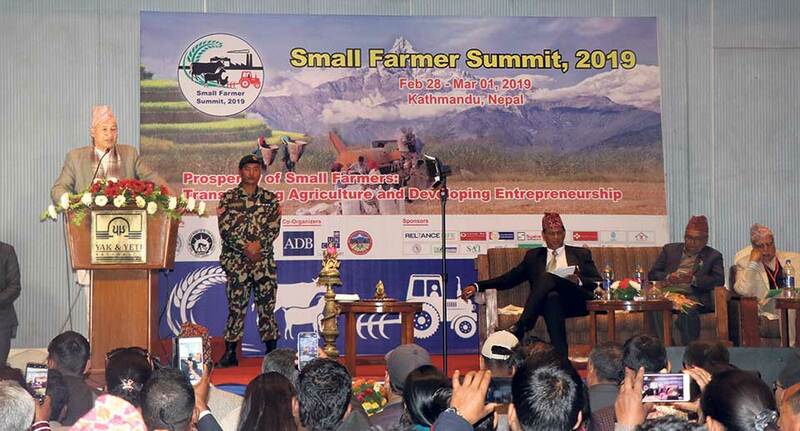 Speaking at two-day ‘Small Farmer Summit 2019’ that concluded in Kathmandu on Friday, Minister Khatiwada remarked that the agriculture sector was the highest recipient of government subsidies aimed at lowering the cost of farmers. He also said that small farmers should get organized through cooperatives to reduce their cost of production. Minister Khatiwada said that collective farming would also help the government in providing various facilities like irrigation, agro inputs, insurance, mechanization, and technological services to farmers in an effective way. “Reducing the cost of production is important. For that to happen, the issue of breed that farmers use is important. Technology also plays a vital role. We must go for mechanization of farming,” Minister Khatiwada said. “There is also the role of the cooperative organizations. They can help in technology transfer, processing, and finding market for farmers. These are things that small farmers cannot do by themselves,” he added. Minister Khatiwada also said that local units in the new federal set up should prioritize the agriculture sector. “It seems that local governments are giving priority to digging roads. If they do not make investment toward increasing production, locals would not be able to utilize the benefit of roads later,” said Khatiwada, adding that services and facilities for farmers were getting channelized through local governments in the federal system. The summit, which has brought over a total of 1,200 participants including 1,000 small farmers from across the country, concluded on Friday with a 14-point declaration. The summit was held with the slogan of ‘Prosperity of Small Farmers: Transforming Agriculture and Developing Entrepreneurship’. During the summit, 28 working papers were presented in 14 various sessions covering wide range of issues, including poverty alleviation, elimination of hunger, employment generation, environment conservation, and sustainable development goals. 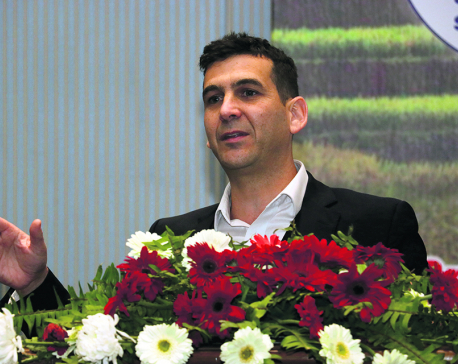 Also speaking on the occasion, Benny Omer, Israel’s Ambassador to Nepal, said that his country was always ready to support agricultural development in Nepal. Israel has been providing training opportunity to the Nepali youth in Israel for learning modern farming skills and innovative agricultural technologies. According to Ambassador Omer, a total of 2,670 Nepali youth have received such training in Israel in the last five years. Shree Krishna Upadhyay, chairperson of the organizing committee of the summit, said that the summit provided a platform for small farmers to share their experiences and challenges to prod the government in framing and drafting policies and programs accordingly.